San Antonio shipped Kawhi Leonard and Danny Green to the Toronto Raptors for DeMar DeRozan, Jakob Poeltl and a protected 2019 first-round pick on Wednesday, ending a standoff of nearly seven months of off-court drama for the Spurs. 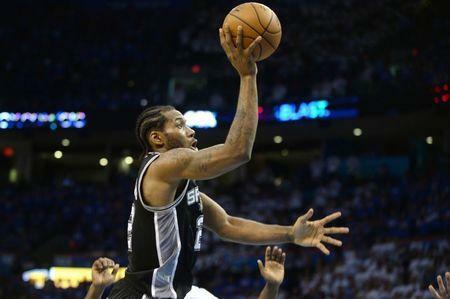 Leonard requested a trade after a meeting with Spurs coach Gregg Popovich. His absence from the team became a point of consternation for Popovich and the Spurs, who didn't have the All-Star forward on the floor for the final five months of last season because of a quadriceps injury. The Los Angeles Lakers, Boston Celtics, Cleveland Cavaliers, Philadelphia 76ers and others checked on Leonard's availability before Wednesday's trade, in which the Spurs were able to acquire another All-Star in DeRozan. If Leonard were to become a free agent after finishing the season in Toronto, the Raptors could offer up to five years and $190 million; everyone else would top out at four years and $141 million. ESPN and The Sporting News reported Wednesday morning that Leonard has "no desire" to play in Toronto and could sit out, hoping to force another trade. DeRozan wrote on his Instagram page Wednesday morning, "Be told one thing & the outcome another. Can't trust em. Ain't no loyalty in this game. Sell you out quick for a little bit of nothing... Soon you'll understand... Don't disturb..."
-- Dwyane Wade announced a lifetime contract extension with Chinese apparel company Li-Ning, which he's represented since 2012, during an event in Beijing to unveil his new Way of Wade 7 shoe. Financial terms were not announced, but the contract calls for him to increase his presence at developmental camps and clinics in China and around the world. Wade, 36, still has not decided if he will continue his NBA career. He said he'll turn his attention to his NBA career when he returns from China. --The Oklahoma City Thunder are targeting guard Dennis Schroder and forward Mike Muscala in trade discussions that would send forward Carmelo Anthony to the Atlanta Hawks, according to Sirius XM NBA's Mitch Lawrence. Per the report, the Hawks would buy out Anthony's contract if they acquired him, making him a free agent. They are hoping to receive an asset, as well, but getting rid of Schroder and his remaining three years and $46.5 million is Atlanta's "No. 1 priority." Multiple reports have pegged the Houston Rockets as the favorites to sign Anthony once he inevitably hits free agency. --The Boston Celtics are in serious talks with the agent for restricted free agent guard Marcus Smart on a four-year deal worth between $46 and $50 million, according to ESPN's Adrian Wojnarowski. Smart, 24, just completed his fourth season with the franchise and said he prefers to stay with the Celtics, who drafted him sixth overall in 2014. He also is fond of coach Brad Stevens and president Danny Ainge. Smart has averaged 9.4 points and 3.9 assists in 261 games (83 starts) over four seasons. Shooting has been an issue as he has hit just 36.0 percent of his field-goal attempts, with his high mark being 36.7, but Smart is highly valuable as a defender with 386 career steals. --The Los Angeles Lakers signed undrafted free agent Joel Berry II to take part in camp, a day after the team finished runner-up in the Las Vegas Summer League. The Lakers actually signed Berry shortly after he went undrafted in June, but he did not play in the Summer League because of an ankle injury. Nonetheless, he will now be in the team's camp and compete for a spot in a backcourt that already includes Lonzo Ball, Rajon Rondo and Summer League MVP Josh Hart. Berry had a decorated career at North Carolina, highlighted by his performance in the 2017 NCAA Tournament which ended with a national championship for the Tar Heels and the Final Four Most Outstanding Player for Berry. As a senior last season, Berry earned first-team All-ACC honors after averaging 17.1 points, 3.5 rebounds, 3.2 assists and 1.2 steals in 33.1 minutes per game.